A motion pad using Fractalize with a stepping envelope to modulate oscillator A.Granular synthesis is used for oscillator B using factory wave sample Cello-Class.wav. These oscillators have a metalic sparkling sound at the high end of the keyboard. In lower octaves this sounds more choir-like. On Oscillator C I'm using wave morphing with a cloud filter which sounds a bit like a class "computer" sci-fi sound. In the performance section there is an X/Y pad to add Oscillator C into the mix. 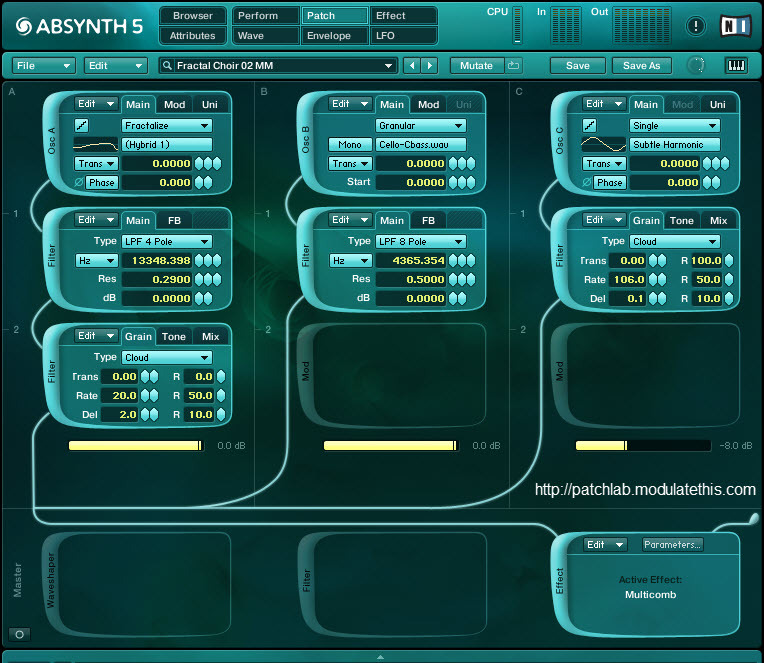 Performance control 3 is assigned to Osc 3's Cloud filter and modulates grain randomness.